Do you ever wish you could practice your saxophone at 3am without bothering your neighbors? Shiji Hamanaga at Best Brass has a solution for you. It's called the E-sax. 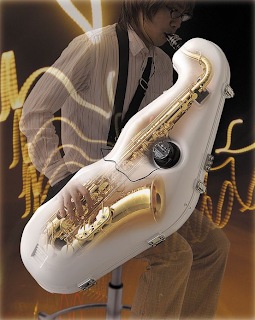 Shiji says that the e-Sax Shiji is not a mute but a sound transformer, because it changes the sound of the instrument weakens or alters the sound of the instrument.....and a sound transformer has 'infinite possibilities'. Hamanaga started his career as an engineer for Yamaha. 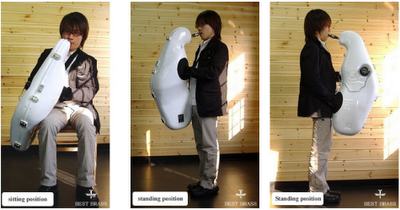 While at Yamaha Shiji, a brass player himself, designed the Silent Brass 'electronic sound silencer'. 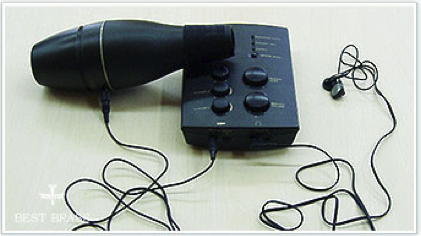 The Silent Brass system is a mute with a small microphone inside it that allows the player to listen to the sound produced through headphones. The unit comes with tone control and reverb, so it sounds like you're playing in a larger space. After leaving Yamaha Shiji invented a similar electronic mute system for trombone, trumpet and French horn, which he called e-Brass. In 2007 Shiji released e-Sax, which presented more problems than the e-Brass system because a saxophone's sound doesn't just come from the bell. The saxophone sound is of course not totally silenced, just reduced by 25 decibels. 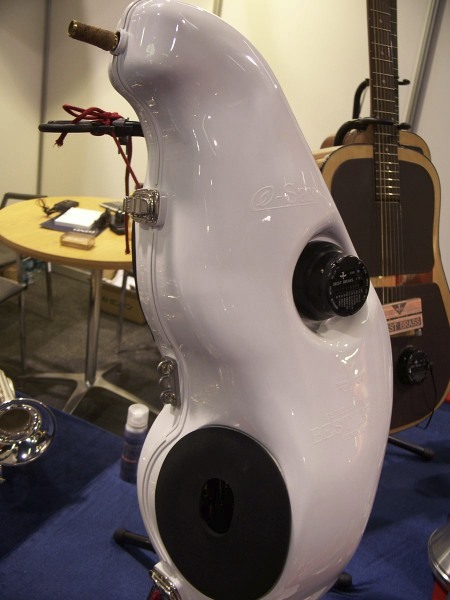 When I was at NAMM this year I got to see the e-Sax up close and it looked like something out of the movie 2001: A Space Odyssey. 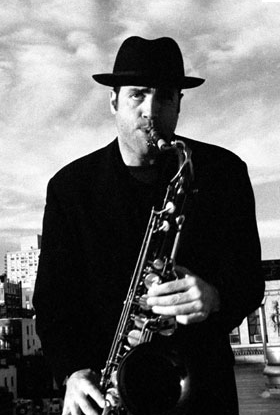 I wanted to share some of my experiences with the E-sax Mute. I’ve had it now for about two and half weeks. I bought it second hand but it was in excellent condition. I paid about half of what they normally go for and I feel that it was as much as I’d want to pay for one. First off the fit and finish is pretty good. It is a bit flimsy but it does the job. The latches and neck strap hooks are sturdy enough. The hook holes are like an old King; three holes in a row. The latches are your standard latches you’d see on any aftermarket case. The adjustment required to fit a horn (as horns vary) are intuitive, easy to figure and sturdy. After getting it set up its easy enough to get your horn in and ready to go. Once you’ve got it set up and your horn in the first thing you notice is how heavy it is. I would say that it nearly doubles the weight I’m used to from my SBA. Not a trivial issue. I have been using a very padded neck strap and a neoprene strap as well (yes, two) and it helps, but not much. I’m thinking of switching to a harness for more support but I always felt like those things made horn players look like they work at Sam’s Club. Anyway, once you’ve got it strapped on you put your hands into the holes. The hand holes are made from a neoprene material and seem like they would hold up over time. I don’t know if they are replaceable if they tear. Once you’ve got your fingers on the keys you notice how odd it feels. There is plenty of room in the case but it’s just awkward. Nothing fatal but you simply notice it all the time which, in my limited experience, tends to make you think about having a mute on your horn instead of thinking about playing. It’s like playing with a five pound weight attached to the bell and a towel stuffed into it. Then there is the playing. It does mute the sound pretty well. I’d guess about 60 to 70%. I also have tried the sax mute made by Lebayle and this is certainly more muted than that by at least 30% (the Lebayle certainly has it’s limitations beyond lack of muting but they list for $35 vs. $600). That said I have found it difficult to play the bell key notes. When playing b or b flat the case vibrates quite a bit and I have to over compensate when blowing to get the notes out at all. Using the headphones is okay but the microphone is really terrible. The sound from the headphones of my horn is really thin and not consistent through the registers. It often distorts in the low end and makes the high end sound very thin. I do like that you can put an auxiliary sound source (IPod) in and that sounds pretty good. Playing music minus one with this setup can be overall decent, though the saxophone sound is more pronounced than I would prefer and there seems to be no way to adjust for that other than turning up the IPod volume, which is horrible for you hearing long term. The manufacturers claim that you can use it for recording but I would not recommend that at all. Ultimately I would say that if you need to mute your horn to practice this is as good as it gets. It does mute the sound significantly and is a pretty good product overall. The major downsides are; the weight (I can’t practice for more than an hour or so without getting back pain and I normally can practice for more than four hours without a break), the awkwardness of having a shell over your horn and hands, and the headphone sound. When I was at NAMM I saw that the company also has a 'sound transformer' for the guitar, but it wasn't on the company's website yet. It was two rubber pieces that covered the tone hole and deadened the sound coming off the top of the guitar, along with the same mic/headphone unit that is on the e-Sax, which by the way includes a built in metronome. Thanks very much for the review- I saw this item at Twigg's, a local music/woodwind store here and was intrigued, but thought the price was too high. Tried it a bit in store and it seemed to not be of very high quality construction but "it works". My main beef with it is the price seems too expensive for what it is. 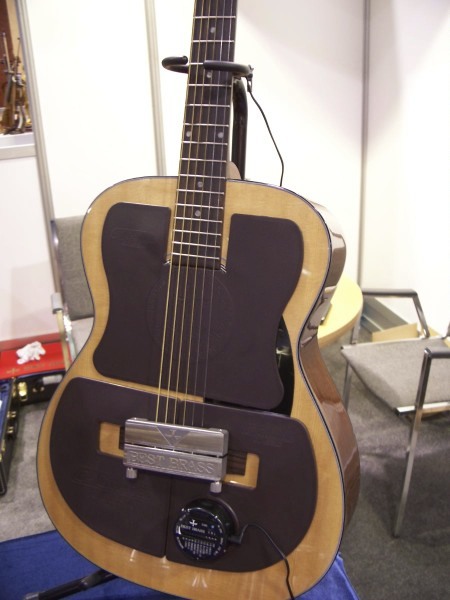 Given the apparent quality of the construction I think it would be better-priced in the $200 range. Also, if I recall correctly there is also a stand that is sold for the case, so that you do not have to support the added weight yourself. Not sure what the price is for the stand. Thanks for this--I've been anxious to see a good first-person review of this thing. The results seem to be pretty much exactly what I would have guessed, though I did secretly hope that these things would turn out to be incredibly good.